This course is presented in a 2-day (HYBRIB course: online modules to be completed prior to live course). This evidence-based course will provide clinically relevant information and training for the evaluation and intervention of male urinary incontinence and pelvic pain, life span specific considerations, including pediatrics, and individuals with neurological involvement. Labs offer skills that are immediately applicable in your clinic and include rectal balloon training, a focus on EMG relaxation training and integration of complete vaginal and rectal examination learned in previous coursework. Lecture will include pathophysiology, physical therapy evaluation and intervention of pelvic floor dysfunction (PFD) in male patients, pediatric and geriatric populations, and neurologic patients. Changes in the pelvic organs throughout the Life cycle and interdisciplinary treatment of pelvic dysfunction will be reviewed. Clinical decision-making and an integration of skills acquired at all CAPP Pelvic courses will be included. 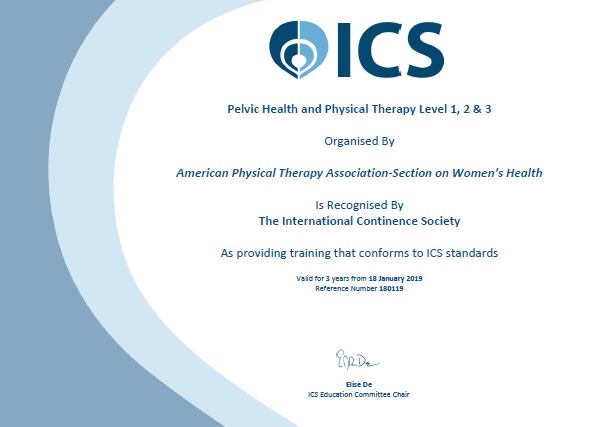 The Pelvic Health Physical Therapy Level 3 course is recognized by The International Continence Society (ICS) as providing training that conforms to ICS standards. Open to: Licensed Physical Therapists, Physical Therapist Assistants. Pre-requisites: Successful completion of Pelvic Level Physical Therapy Level 1 and the two Level 2 courses: Pelvic Health Physical Therapy Level 2 Bowel Dysfunction AND the Pelvic Health Physical Therapy Level 2 Pelvic Pain are required prerequisites for this course. Experience of 1 year or more in regularly managing patients with pelvic physical therapy, or working in a clinic with other experienced pelvic physical therapists, is strongly recommended prior to attending this course; lack of experience may greatly inhibit participant comprehension and attainment of skills during the course. The Certificate of Achievement in Pelvic Health Physical Therapy is an optional route if you wish to take a bigger step towards your career. Section on Women’s Health (SoWH) has developed the Certificate of Achievement in Pelvic Physical Therapy (CAPP) to certify that a physical therapist has completed a comprehensive education, training, and testing program for the management of patients with diagnoses of pelvic health dysfunction, such as urinary incontinence and pelvic pain. The CAPP is awarded to physical therapists who complete three courses of training in pelvic physical therapy (Level 1, Level 2, Level 3), pass written and clinical testing requirements at each level, and successfully complete a written case report. To learn more, please visit: www.womenshealthapta.org/capp. Dates & Locations will be posted below as they become available.